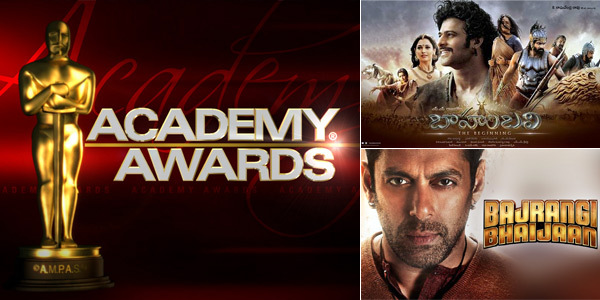 Raaga.com: BAAHUBALI or BAJRANGI BHAIJAAN – Which film will win ticket for Oscar Award? BAAHUBALI or BAJRANGI BHAIJAAN – Which film will win ticket for Oscar Award? The race for the all important award of the year - the ultimate - ‘Oscar Award’ is round the corner and the Indian jury to select India's official entry to the Oscars 2016, headed by the chairperson Amol Palekar will soon be meeting in Hyderabad to elect the country’s official entry in the best foreign category of the 88th Academy Awards. It may be noted that instead of Mumbai the selection committee has decided to meet in Hyderbad to avoid Mumbai’s madding crowd of lobbyists. From Mumbai the movie’s that are toying to find a place in the Oscar race are Vishal Bhardwaj's HAIDAR, Anurag Kashyap's UGLY, Raj Kumar Hirani's PK, Neeraj Ghaywan's MASAAN, Omung Kumar's MARY KOM and last but not the least Salman Khan’s BAJRANGI BHAIJAAN is being betted as the ‘surprise’ recipient for the prestigious honor. Interestingly from Bengal Mithun Chakraborty’s new wave cinema EK NODIR GOLPO is also a tough contender and is being considered as an entry in the Best Foreign Language Film category at the Academy Awards. From the South, the Telugu Film Chamber of Commerce has announced SS Rajamouli’s BAAHUBALI, the movie that recorded thunderous box office record both nationally and globally as their official entry to Indian Selection Committee. BAAHUBALI that boosts an emotional tale and eye catching International style action scenes with Indian roots looks a prospective hope for Oscar. If BAAHUBALI is selected then it will become the First Telugu movie to walk in the Oscar race after 29 years because as per Telugu Film Chamber of Commerce each year they send a Telugu film to Indian Selection Committee but alas none has been selected so far. The Oscar selection panel will be studying over 45 films and selecting India’s official entry for the next Oscars. The official confirmation on the same will be made on September 25. So let’s ask the readers- Which film has the potential to win an Oscar - BAAHUBALI or BAJRANGI BHAIJAAN?